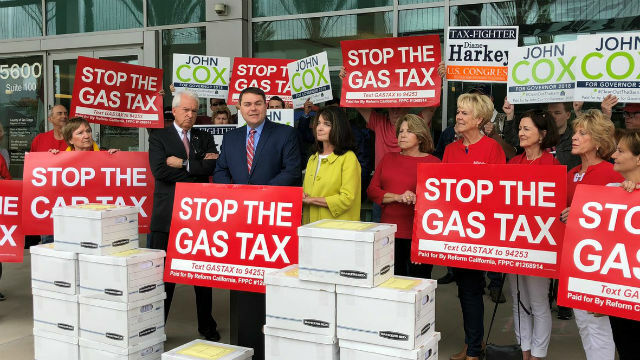 Rancho Santa Fe businessman John Cox — the Republican candidate for governor — is hailing news that a ballot measure to repeal the gas tax qualified Monday for the November ballot. “This is a message to the millions of forgotten Californians ignored by the Sacramento political elite — help is on the way,” Cox said in a statement. Cox is an honorary chairman* in the effort to repeal Senate Bill 1, which Gov. Jerry Brown signed last year in hopes of raising more than $5 billion annually for road repairs and mass transit projects. The measure qualified for the Nov. 6 ballot by securing more than the needed 585,407 signatures of registered voters, state officials said. The paper said Brown has at least $14.8 million in his campaign account available to fight repeal. But KOGO radio host Carl DeMaio, the former San Diego councilman, said he was thrilled by the news. “This is a huge win for the tens of thousands dedicated and organized grassroots volunteers who helped collect signatures,” said DeMaio, chairman of Reform California and a leader of the repeal campaign. DeMaio predicted voters would repeal SB1 in November. “The gas and car tax hikes will cost the typical family of four $700 more per year in higher taxes, but the roads will not get fixed because the politicians will continue to divert the funds as they always have in the past,” DeMaio said. He said the next step would be the Secretary of State’s Office assigning a ballot proposition number and issuing a title and summary for the measure to appear in the official state voter guide this fall. “Sacramento politicians have been using dirty tricks to thwart the Gas Tax Repeal Initiative campaign and we are prepared to mount a legal challenge on any false and misleading Title and Summary that is issued,” DeMaio said. *Correction: An earlier version of this story incorrectly called Cox the chairman of the effort.